Are you planning to take your kids skiing for the first time this winter? Don’t know what ski gear to buy or rent? Well, you’ve come to the right spot to find out what is the Best ski gear for kids and what gear to buy and rent this winter! I have turn to some of my favorite mama friends who are big ski/snowboard fans, and in my opinion, experts when it comes to knowing the best ski gear for kids. Also, I have a few years under my belt skiing with my own children and also skiing on many different ski mountains and conditions—icy, heavy powder, rainy sleet, sunny–to know what gear has been tried and true for my own children. 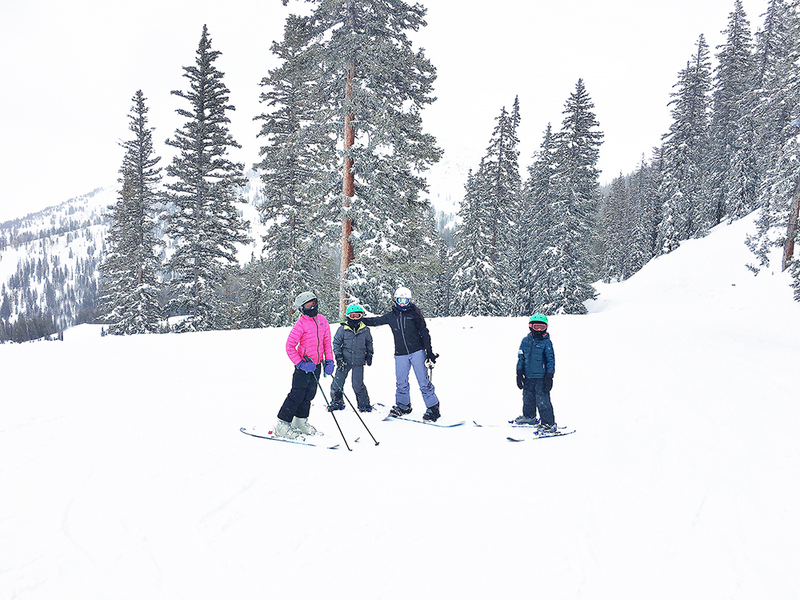 The kids gear you should buy before taking your child skiing are any kind of clothing, outerwear, googles and mittens. I will list my favorite brands below. The gear you should rent are ski boots, skis, ski poles, snowboard (if you child prefers) and helmets (if you plan to have a short ski season). Unless your child is crazy good and an expert skier, which I have definitely seen on the mountain, just stick with renting or buying used. Children grow every year and as they grow, the ski gear will have to grow too. My girlfriend Kate says they attend ski swaps every year to switch out old outgrown skis and pick up new pair of used skis. And if they don’t find the right size for their child, they do a long season rental from a local ski shop. This is highly recommended if you plan to ski throughout the entire winter season and not just one time. When we go on a ski vacation, we always rent our ski gear at a local ski shop at the base of the mountain but not at the actual resort. They are ALWAYS cheaper than the resort and you usually get better gear than what is offered at the resort. Also, it will save you time with minimal waiting in line period. Keep in mind to rent at a ski shop close to the resort, so if there are any problems to your gear you are just a quick drive away. If you feel like you really need to buy ski gear but don’t want to spend the money on new gear, check out your Facebook marketplace and yard sale FB groups. You can usually find ski gear of any kind on those sites. Also, any local used sport shop is a great resource also. Helmet–okay this is one gear that is debatable on whether to rent or buy. We own helmets for our kids but when we travel to a ski destination, we rent the helmets to save on packing space. You can usually get a few years on the size of helmet for your child so it’s worth it to buy if you ski a lot. Usually helmets are about $10 to rent a day and that can add up quickly. My favorite ski helmet brand is Giro, and my mama ski friends agree with me. I also like to get a colored helmet, so I can see my child on the mountain! Base Layer–I usually don’t spend a lot of money on the base layers. We usually pick up leggings and a long sleeve shirt at Target. But you want something that is made from 100% polyester and that will lay flat and seamless against the body. Look for warmth without weight. Mid-Layer–The mid layer will go over the base layer but under the outerwear. I like to think of this layer as the cozy, really warm layer. We usually buy a warm fleece pullover sweater. Remember to not go too bulky. You want your child to be able to move freely. I love Patagonia’s products that I am linking below. They have thumb holes, quick-wick spandex fleece fabric that will keep your child warm but also dry! Outerwear–you definitely want to buy outwear for ski conditions. The mountain is cold and wet, and you want to make your child as warm, dry and comfortable as possible. I like to stick with brand new clothes because used clothing fibers breakdown over time. Unless its minimally used, I would stick with new. One of my favorite outwear brand is Patagonia because it grows with the child and you can get a couple of years out of it. The Patagonia kids pants waist is adjustable, and there is a two-inch growth in the length. Their fabric is durable, insulated and waterproof, and comfortable! These are such important features needed on the mountain. Also their pants have internal gaiters to keep out the snow. If you buy the Patagonia ski pants and jacket together, they have a way to easily attach for the jacket doesn’t ride up, or the pants don’t fall down when your child is shredding down the mountain. I have linked them below! Goggles–Yes, your child will need goggles. Its best to buy a pair. Goggles will protect their eyes from the sun, wind and snow. It will help them be safe because they will be able to see when heading down the mountain. You don’t have to buy the most expensive pair. We usually like to keep is under $30 for children’s goggles. We like the Smith brand! Gloves–With my kids to have a base layer of gloves and then top that off with insulated mittens! Mittens are the way to go because they will keep your child’s little fingers warm. Then I like to put hand warmers in their mittens. It’s works like a charm, and I never hear any complaining about cold fingers. If you want to get more ideas for dressing your child for Winter Weather, I did a whole post on it last year that has great resources.